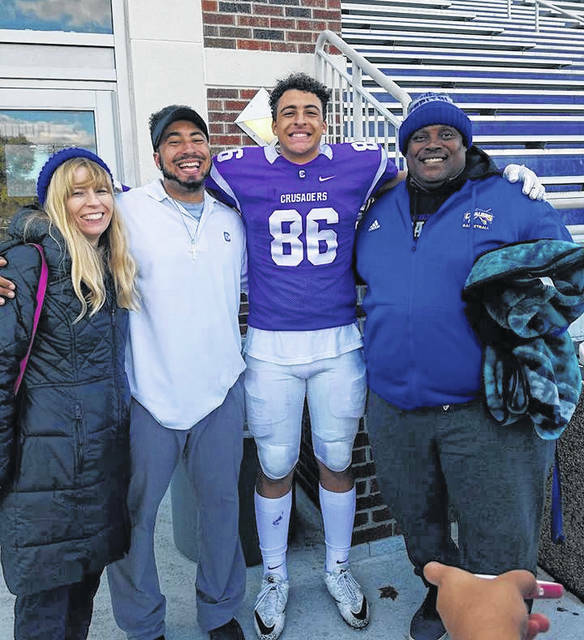 Photo Provided The Lee family shares a moment at a Capital football game this season. From the left are Peg, Kris Jr., Kameron and Kris. There is no question there is a Lehman Catholic football connection with Capital University, with both Wyatt Long and Kameron Lee currently playing for the team. But, there is even more a Lee family connection with the program — and the school. Kris Lee Jr got see his brother play up close this past as a volunteer graduate assistant — and their sister Kassie Lee — the children of Peg and Kris Lee — is a thrower on the track team. Kris Jr. had finished four years of playing linebacker for the Crusaders and became a volunteer assistant, coaching the defensive backs. At the same time, Kameron was beginning his freshman football season at Capital. “It just seemed like the perfect fit,” Kris Jr. said. “To be able to work toward my Masters while doing the thing I love most. And because we are four years apart, I never got to play with Kam at Lehman. I would come back for games on Friday nights and be on the sidelines. As it turns out, Kris help the defensive backs and Kameron, an offensive tight end, began the season on the scout team. Kris knew that would be short lived. Kameron finished the season with 10 catches for 120 yards and four touchdowns. His most memorable play was probably his first touchdown catch against Ohio Northern. Kameron will always remember that play. Kam is motivated for the 3-7 Crusaders to turn things around next year. And Kris expects to be right there on the sidelines against next year. “That is the plan, to become more of an official grad assistant,” Kris said. “That was a great experience this year working for David Parrott (co-defensive coordinator and defensive backs coach). He is such a great coach. I learned a lot. I don’t know what position I will be coaching. And the Lee family legacy will continue. With the two brothers building a bond as part of the same team —something they were never able to experience before. https://www.dailycall.com/wp-content/uploads/sites/30/2018/12/web1_45331534_10214913678490366_6417476031296307200_n.jpgPhoto Provided The Lee family shares a moment at a Capital football game this season. From the left are Peg, Kris Jr., Kameron and Kris.